As my confidence grows and my search for a weekend therapist lingers on, I have embraced each weekend as a chance for new adventures. Barry was sick last weekend, so I heroically offered to let him stay in bed and rest on Saturday while I managed the kids. After hearing Zoe complain that she was bored for the 15th time, we called a friend of hers and invited her to the mall for lunch and walking around. Yes, I took 3 typical children, 1 child with autism and a dog to the mall BY MYSELF. That is how cocky I am getting. And, you know what? It went beautifully. Sure, the girls bickered and Gray asked (on his iPad) to be taken to the bathroom multiple times, but when we left, I felt no more frazzled than any other parent who takes a group of kids to the mall. The day was a huge success: the kids had fun, we burned a few hours, Barry heralded me as the best wife ever for letting him sleep off his cold and I felt good about the world. So, as you would expect, I was looking forward to the carnival at Lena’s preschool on Sunday. We had already done a carnival at the elementary school, the weather was beautiful and Barry felt well enough to join us. What could go wrong? If Hope goes in the petting zoo, does she become one of the petting attractions? What is the best way to load a boy and dog who are tethered together on to a tractor for a hay ride? 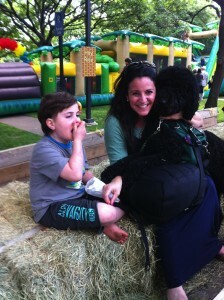 Yes, the day was great fun and everyone was enjoying the carnival, until…a kid got in the bounce house wearing glasses. Gray is obsessed with ripping glasses off of people’s faces. It’s a charming habit. As soon as I saw that kid get in the bounce house, my stomach dropped. Gray lunged for the glasses and pulled them off that poor boy’s face before he even realized he was under attack. The kid screamed and tried to grab his glasses back. I tried to reach my arm through the webbing of the bounce house “window” to get hold of Gray’s arm. I yelled for the kid to wait and let me get the glasses back for him. I knew that the glasses would not hold any interest for Gray now that they were off of their owner’s face. I knew that, if the kid would just relax a second, Gray would drop them or give them to me. Of course, this 4-year-old now missing his glasses was only slightly more coherent than Gray. He was clearly panicked to get his glasses back and started a game of tug-of-war that miraculously ended with him rolling over backwards with his glasses in his hand. I only took a moment to celebrate the glasses remaining intact. Now, Gray had snapped into full-blown mania. He started laughing hysterically and dropping kids to their knees with pinches or hair-pulling. As I pulled him free of the bounce house and got him to his feet, I turned to gather Hope and re-attach her tether to Gray’s belt. That’s when Gray sank his hand into a lovely mop of curly hair. The girl with the lovely hair shrieked and I whipped around to start untangling Gray’s fingers. I began my mantra again, but the mother was clearly unnerved by how long it was taking me to get Gray to let go. I tried to explain that it would take me a minute to get his hand unclenched, but she did not seem to understand what I was saying. I finally freed the girl and left her to cry in her mother’s arms as Gray and I escaped the scene. So, believe it or not, I think that the event was more or less a success. I mean, we had 90 minutes of family fun before disaster struck. If only people would stop bringing their glasses-wearing kids out to places like this, it would prevent problems like these from ever happening! You are my shero!!! You write so beautifully and descriptively I feel like I was there rooting for you to save the day!!! I love how you see the humor in these situations – and your overall optimism . Awesome, Rhoni. You are awesome. ha, ha, ha, is it ok to laugh at this? as you wrote it, it was like I could see it w/ all the emotion with the undercurrent of humor in spite of it all. loved the picture too. sounds like “Life is an adventure” & you are living it. This is fabulous. I laughed out loud, while somewhat being able to relate to the whole experience. I love your blog. I’m glad I found it, and definitely keep writing. You are very talented. Thank you, Jennifer. I really appreciate your kind remarks. Can you tell me how you found my blog?